On the outside it may seem like I’m producing less food/content this month but in reality I’m cooking so.much.Persian.food. I’m just not nailing it every single time. This month has thrown some tougher recipes at me, and I want to perfect these before I post them. But yo. I nailed Tahdig. FINALLY. I’ve been using Jake Cohen’s recipes and this is my favorite one. It looks more involved than it is. 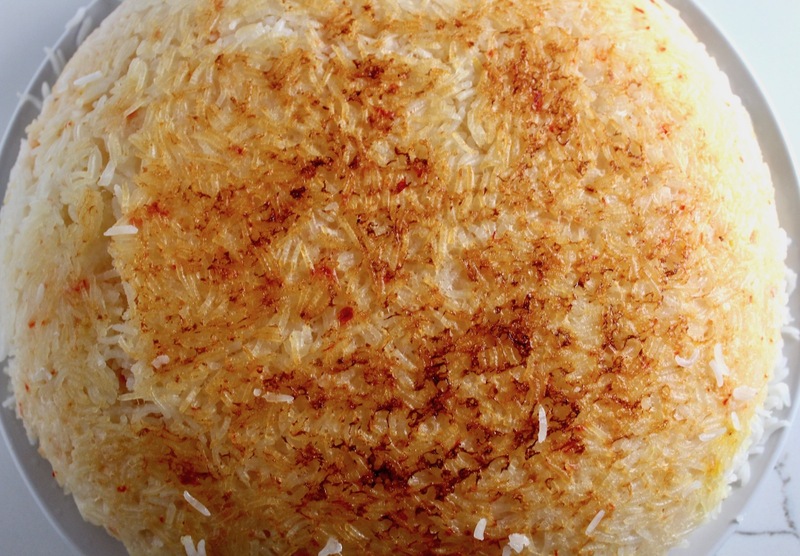 Tahdig is actually quite simple to make. Not as simple as just making rice (i.e. 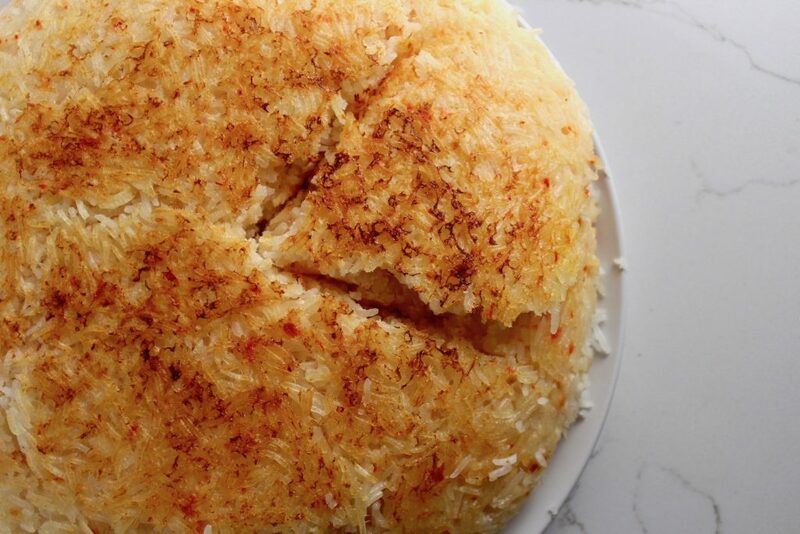 throw it all in a pot for 15 min) but you don’t need to plan your night around Tahdig. The most time consuming part is letting the rice soak. Why do this? I don’t know much about science and all – but from experience and making this dish numerous times I can tell you the rice is perfect every time. So why question what works? 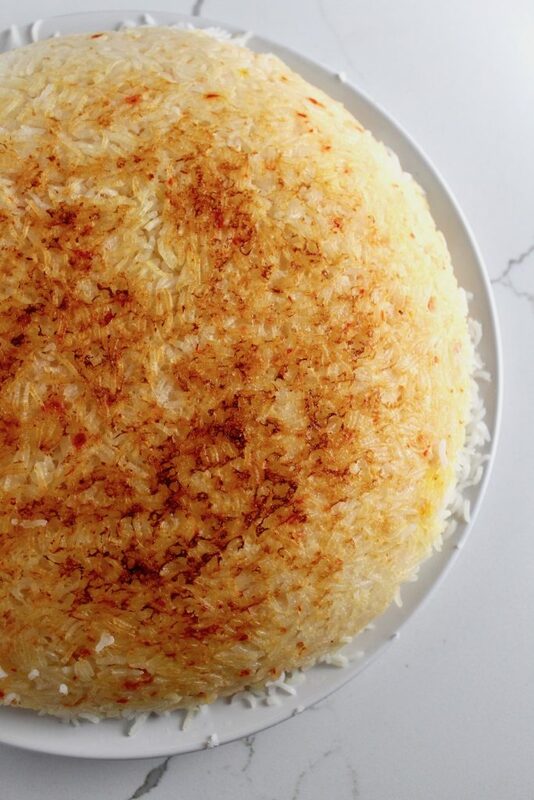 I love tahdig not only for the perfectly cooked rice but the CRISPY BOTTOM. This is why you add a kitchen towel around your lid…to capture the steam drippings that would cause your otherwise crispy bottom to go soggy. Thank you next. Jake has a Potato Tahdig recipe, but I found that the potatoes just interfered with the amount of crispy rice produced. Boyfriend disagreed. But I make the food in this household so I win. 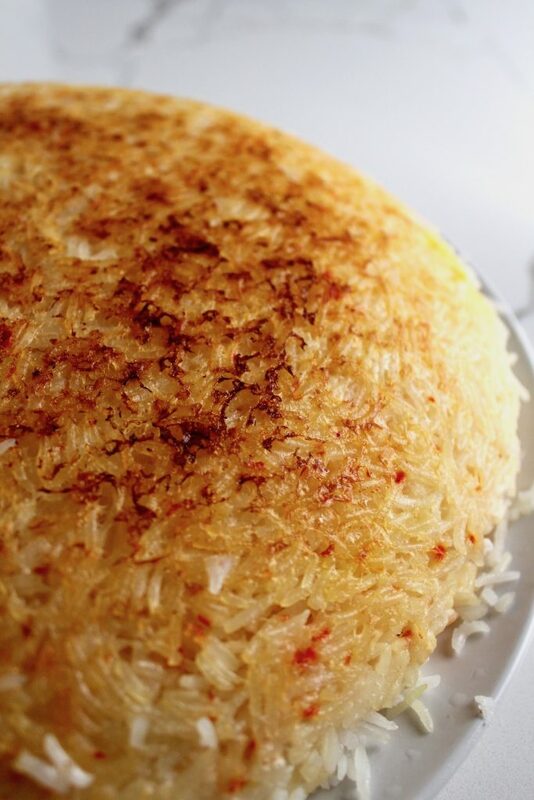 If I could find a spherical pan that produced 2x the crispy rice, well I’d be in Tahdig heaven. The thing is, even if your crispy bottom sticks to the bottom of the pan…not all is lost. You can remove it with a spatula and just put it on top of your pile of rice. Yet, I am a perfectionist (apparently only with Tahdig) and therefore I made this 100 times before I got the perfect crust I was looking for. Perfect crust aside – the yogurt, saffron and butter create a luscious quality to the rice and make it incredibly satisfying to eat. And eat and eat. Recipe reposted from Wake & Jake. Start by taking a large bowl and filling it with cold water. Add your rice and a tablespoon of salt. Let this soak in the water for about an hour. When you’re just about ready to make the rice, you’ll prep your saffron by grinding it or just smooshing it between your fingers. Yes, smoosh. Then add a couple tablespoons of boiling water and let this sit for a few minutes. The water will be nice and red. While this is happening, par-cook your rice. This means cooking it just partially. So you’ll drain the soaked rice, and get it on the stove with enough water to cover it. Add a tablespoon of salt. Bring it to a boil and let it simmer for 5 minutes. You want this just cooked, but still very chewy. Then, take your yogurt and add it to a medium bowl. Add two tablespoons of melted butter, 1/2 tsp of salt and the red saffron water. Drain your par-cooked rice and rinse with water to stop the cooking process. Take a 10 in non-stick shallow pot and coat it with 2 tablespoons of the melted butter. Add 3 cups of the par-cooked rice to the yogurt mixture and incorporate it well. Add this mixture to your greased pot. Coat the bottom and up 2 inches on all the sides. Dump the remaining rice on top in a pile. Poke some holes in your rice with the back of your spoon (just an inch deep) and pour the remaining butter all over the top of the rice. Wrap a clean kitchen towel around the bottom of your lid and place it over the pot so it’s secure. Turn the burner on to medium high heat for about 4-5 minutes. You’ll hear the rice start to crackle in the pot. Then, turn the heat down to medium low for about 15-20 minutes. Remove the lid and take a spatula to kind of loosen up the rice that’s touching the pan. You don’t want to break this up just start to remove some of the stuck on pieces. Place a plate over the rice – prepare yourself – and FLIP for perfect crispy rice. Best eaten immediately but the rice will still be good in your fridge for a few days.